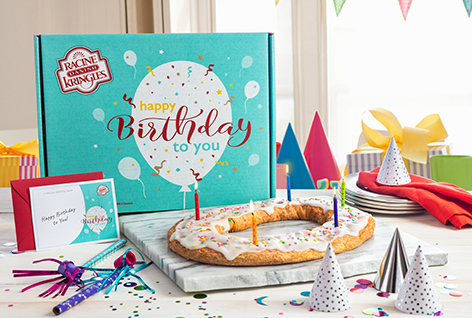 Wish someone an extra special day with our delicious Birthday Cake Kringle - made with yellow cake batter and custard, topped with a delicious sweet icing and sprinkled with colorful confetti or select delicious flavors of your choice. 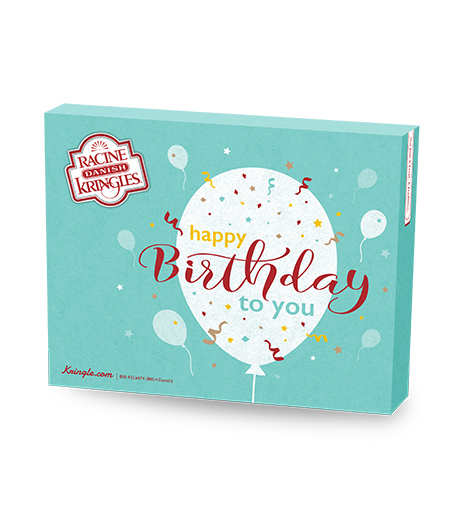 Your gift will arrive in our cheerful Happy Birthday Gift Box that will let your recipient know how special they are to you on their big day! 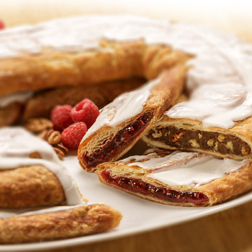 Gift Box Includes–Kringle of your choice, personalized birthday card, 5 candles and 2 birthday party blowers. Sugar, wheat flour, margarine (interesterified soybean oil, water, salt, mono- and diglycerides, colored with annatto/turmeric. Calcium disodium edta added as a preservative. Artificial butter flavor. Vitamin a palmitate added. ), yellow cake (sugar, enriched flour bleached (wheat flour, niacin, iron, thiamin mononitrate, riboflavin, folic acid), partially hydrogenated soybean oil, dextrose, egg white, nonfat milk, baking soda, sodium aluminum phosphate, modified wheat starch, popylene glycol mono & di-esters of fatty acids, soybean oil, salt, mono and di-glycerides, sorbitan monostearate, eggyolk with sodium silicoaluminate, soy lecithin, tetrasodium pyrophosphate, cellulose gum, dried corn syrup, calcium acetate, polysorbate 60, xanthan gum, guar gum, artificial flavor, yellow 5 and red 40, soy flour), corn syrup, brown sugar (sugar, cane syrups), eggs, corn syrup, corn starch, contains 2% or less of the following: water, soy protein, soy lecithin, yeast, dextrose, salt, citric acid, yellow 5 & 6, natural & artificial flavors, potassium sorbate preservative, sodium benzoate preservative, tocopherols preservative, calcium carbonate, xanthum gum, locust bean gum, partially hydrogenated soybean & cottonseed oils, maltodextrin, agar-agar, calcium propionate preservative, cinnamon, malted barley, color added, rice flour, partially hydrogenated soybean/cottonseed oil, soy flour, canola oil, carrageenan, gum tragacanth, titanium dioxide, red 3, yellow 6, blue 1, blue 2, carnauba wax, confectioner's glaze.